In the next few weeks, researchers in Antarctica will drill through 1,100 metres of ice into a lake that has remained sealed for millennia. Here’s what they hope to find. Douglas Fox is a journalist in northern California. At a remote camp just 600 kilometres from the South Pole, the race is on to melt 28,000 kilograms of snow. Within the next two weeks, a team of technicians will use that hot water to melt a hole through 1,100 metres of ice, straight down to the bottom of the Antarctic ice sheet. Their quarry is a hidden lake that has been cut off from the rest of the world for thousands of years. The life they expect to find there inhabits one of the most isolated ecosystems on Earth. The pool of water, known as Subglacial Lake Mercer, covers 160 square kilometres — twice the size of Manhattan — and might be 10–15 metres deep. Despite temperatures that are likely to stay below 0 °C, the lake doesn’t freeze, because of the intense pressure from the ice above. Researchers discovered its ghostly silhouette a little more than a decade ago through satellite observations, but no human has directly observed the lake. The drillers hope to tap into Mercer sometime around Christmas. 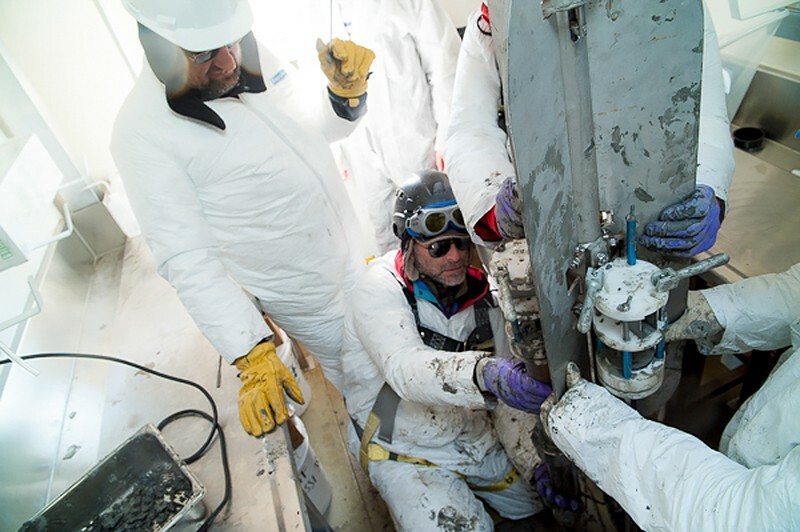 Then, a team of researchers from more than a dozen universities will hoist samples of water and mud from its interior. The scientists will also send a skinny, remote-operated vehicle down through the 60-centimetre-wide hole to explore the dark waters with video cameras and grab samples with a claw. 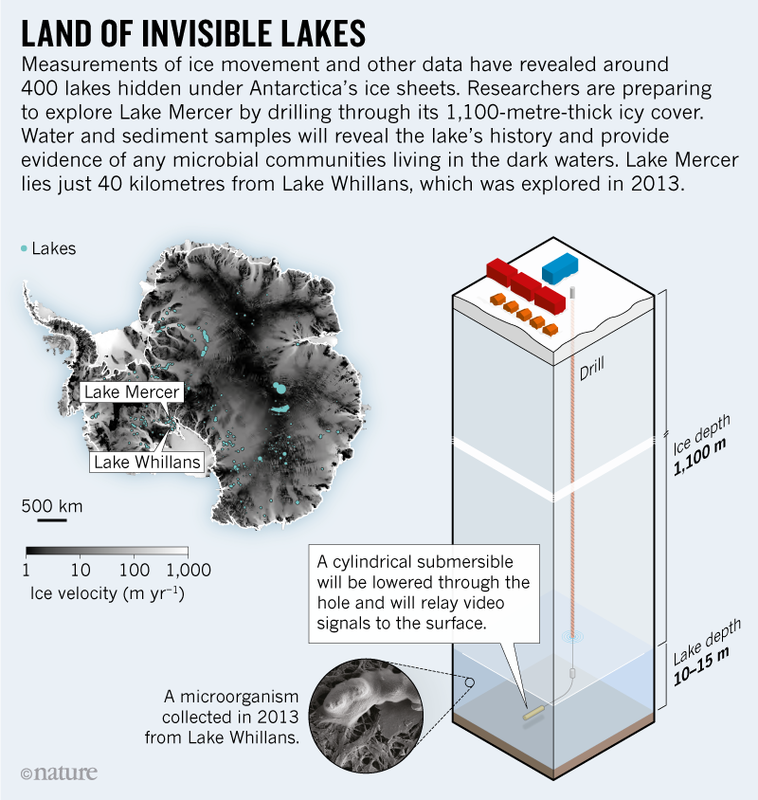 Antarctica conceals more than 400 lakes beneath its ice, and Mercer will be the second that humans have sampled directly. It marks the first time scientists will use a remote vehicle to roam beneath the ice sheet. Known as SALSA (Subglacial Antarctic Lakes Scientific Access), the expedition is being funded by the US National Science Foundation at a cost of nearly US$4 million. Its aim is to explore the ice-shrouded environment of perpetually sunless rivers, lakes and wetlands that exists in Earth’s polar regions and covers an area as big as the United States and Australia combined. This ecosystem is much more isolated than even the deepest ocean trenches. The subglacial biosphere provides an analogue for habitats deep inside Mars or on the ice-covered moons of Jupiter and Saturn. The scientists leading the project hope that the Lake Mercer ecosystem will shed light on what kind of life can survive in such remote environments. Mercer sits within a constellation of nine lakes in West Antarctica that was first discovered in 2006, when satellite altimeter measurements revealed that the ice surface in certain places was periodically rising and falling by up to 10 metres over periods of months1. Helen Fricker, a glaciologist at the Scripps Institution of Oceanography in La Jolla, California, realized that they were subglacial lakes filling and emptying, causing the ice overhead to lift and then drop (see ‘Land of invisible lakes’). Sources: Tristy Vick-Majors/SALSA; M. R. Siegfried & H. A. Fricker Ann. Glaciol. 59, 42–55 (2017). Evidence pulled up from the drilling project at Lake Whillans has spawned a series of discoveries that have shaped the current programme at Lake Mercer, 40 kilometres to the southeast. The water from Lake Whillans teemed with 130,000 microbial cells per millilitre — a population 10–100 times bigger than some researchers expected2. Many of the microorganisms obtained their energy by oxidizing ammonium or methane, probably from deposits at the bottom of the lake3,4. That was a key insight, because it suggested that this ecosystem — seemingly cut off from the Sun and photosynthesis as an energy source — was still dependent on the outside world in an indirect way. When they drilled into Lake Whillans, researchers thought it had been covered by ice for at least 120,000 years, or possibly up to 400,000 years, coinciding with the last time the West Antarctic Ice Sheet was thought to have melted so dramatically that the lake area had been exposed to the ocean. But in June, Scherer reported evidence that Lake Whillans was connected to the ocean possibly as few as 5,000–10,000 years ago5. This relatively recent delivery of food has big implications. “It’s probably part of the reason we saw such a productive ecosystem” in the lake, says Brent Christner, a microbiologist from the University of Florida in Gainesville who was part of the 2013 expedition and is also involved in the current programme. When the researchers drill into Lake Mercer, they’ll come armed with new instruments to answer some of the questions that emerged from the previous project. Mercer is twice the size of Lake Whillans, and five times deeper — but was probably connected to the ocean at the same time as Whillans, says Scherer. Given the realization that the lakes might not have been cut off for tens of thousands of years, the team hopes to learn what Lake Mercer’s inhabitants are eating. They could subsist on ammonium, methane and other organic compounds from relatively fresh food deposited a few thousand years ago, or they might consume less-easily digested material that is millions of years old. Discovering the microorganisms’ diet could help the team to predict how much life might inhabit other subglacial lakes that have been isolated for a lot longer. It could also hint at how much life, if any, might survive below the surface of Mars — a planet that used to be much more hospitable billions of years ago, when water was present on its surface. Priscu suspects that if life exists on Mars, much of it would be living off carbon that was laid down by photosynthetic organisms, when the planet was wetter. The team hopes to get a lot of answers about life in Lake Mercer by extracting a core of mud up to 8 metres long from the base of the lake. Brad Rosenheim, a palaeoclimatologist at the University of South Florida in Tampa, will use an advanced technique to analyse the mud for carbon-14, a radioactive isotope formed in the atmosphere that decays to undetectable levels within about 40,000 years. This could reveal how much of the lake-bottom muck was laid down the last time the ocean reached this spot. Such evidence would provide an estimate of the amount of fresh food that was deposited and the degree to which microbes are now eating this young material, relatively rich in carbon-14, versus gnawing on older carbon. That could help researchers to determine what kind of life might populate other subglacial lakes that have been cut off for an even greater length of time. Christner hopes to enhance this picture by analysing the core for scraps of DNA left behind by sea sponges, brittle stars, crustaceans or other marine life that arrived with the most recent ocean invasion, several thousand years ago. This could provide further information on what today’s resident microorganisms are eating. Harwood and his colleagues will study the microscopic diatom shells that they expect to find at the bottom of Lake Mercer. By matching up the diatom species found in the core with records of when those species went extinct in other areas, they hope to date the movements of the West Antarctic Ice Sheet. This evidence could indicate when the ice sheet melted significantly in the past and what the climate was like then, says Harwood. That could help researchers who are trying to forecast when global warming will trigger runaway melting of the West Antarctic Ice Sheet, which in turn could raise sea levels around the globe by several metres. The SALSA team also hopes to learn whether more-complex organisms, such as animals, might inhabit the subglacial world. In fact, some researchers wonder whether they missed something major when they drilled into Lake Whillans in 2013. At that time, Whillans’s oxygen levels were low — but survivable by a broad range of aquatic animals. And the abundant bacteria in the lake could potentially support microscopic animals such as worms, rotifers or tardigrades. But the researchers were surprised when DNA studies showed no evidence of such creatures2. And a video camera that was lowered into the hole for a few minutes did not record any such life. Then, in 2015, the team discovered a different kind of surprise. 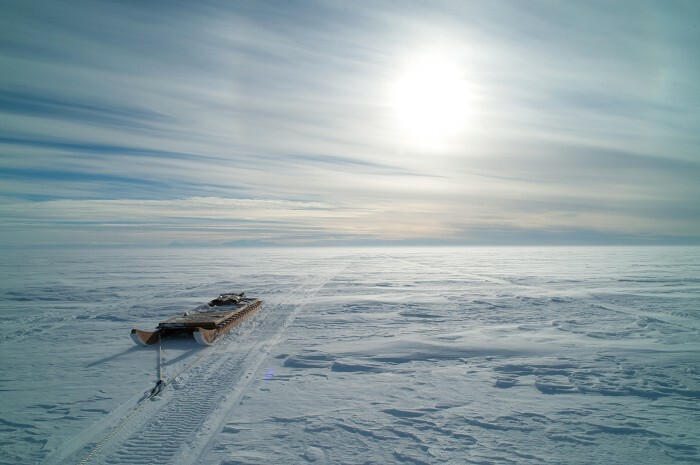 They drilled through the ice at another location, 100 kilometres downstream from Lake Whillans, where the ice sheet begins to float on the ocean. Beneath 755 metres of ice, they encountered a sliver of sea water just 10 metres thick. Because the water at that point is more than 600 kilometres from the sunlit edge of the floating ice shelf, researchers did not expect to find complex life. And when they lowered a camera into the hole, the blank images that streamed back confirmed their suspicions — for eight days. Then, they sent down a remote-operated vehicle, and its video cameras soon caught fish, amphipod crustaceans and other animals milling about — in an environment that should not have been able to feed such creatures, because microbial life was scarce. Priscu now wonders whether Lake Whillans could have also harboured animals that didn’t show up in the few minutes of video they captured from their static camera. This time, they are coming to Lake Mercer with better equipment: including the thin submersible that discovered the animals beneath the ice shelf in 2015. With its three video cameras and claw, it will explore Lake Mercer, venturing up to 100 metres from the borehole and sending images to the surface through a tether. Priscu looks forward to that moment. He thinks that the lake should be capable of sustaining animals. Fricker, H. A., Scambos, T., Bindschadler, R. & Padman, L. Science 315, 1544–1548 (2007). Michaud, A. B. et al. Nature Geosci. 10, 582–586 (2017). Achberger, A. M. et al. Front. Microbiol. 7, 1457 (2016). Kingslake, J. et al. Nature 558, 430–434 (2018).